Crowdfunding has become an increasingly popular method of raising capital among Australian craft beer businesses – both those looking to enter the market and existing businesses wanting to expand. With the Australian government considering the introduction of equity crowdfunding here next year, which would see a fresh wave of funding drives launched, and competition only getting tougher, it's a route down which more businesses are likely to head. But what exactly is crowdfunding? Why is it so popular now? And what are its benefits and potential pitfalls? 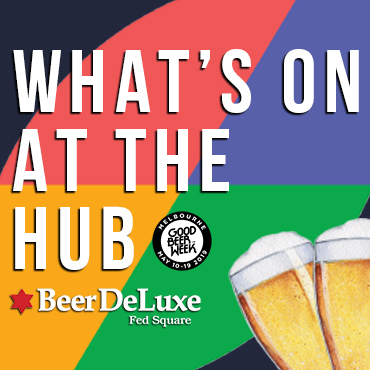 In part one of a two-part Big Issue feature, Will Ziebell speaks to one of the men working for Australia's biggest crowdfunding platform, Pozible, and one third of the trio behind Black Hops Brewing, who raised the money to complete their Gold Coast brewery via Pozible. In part two, he digs further into the topic with a Q&A featuring supporters and critics of crowdfunding from both Australia and overseas. At Crafty Towers, barely a day goes by without a media release landing in the inbox from the next bar, brewery or bottleshop launching a crowdfunding campaign. As a result (and because there's been a small number we regarded as somewhat fishy), we don’t tend to write about them until the project has been successful – and only then if newsworthy – because, if we did, you’d be reading about little else. But, with so many businesses turning to crowdfunding – and equity crowdfunding potentially only six months from approval in Australia too – it’s worth asking just why it has become a go-to for so many new and existing businesses, and why some manage to find success where others fail. Simply put, crowdfunding is the process of using a lot of people to fund a project. They often give a small amount of money, typically in return for something. It takes many forms, with rewards-based, equity, and donations being among the most common. Historically speaking, crowdfunding isn’t that new; back in the ancient days of print media people used to subscribe to books before they were published. And plenty of subscriber-based services have operated as a form of crowdfunding, even if it was only ever used in a few industries. But the rise of crowdfunding services like Kickstarter, Indiegogo and Pozible – and their integration with social media – has made the process more prominent than it has been at any other time. 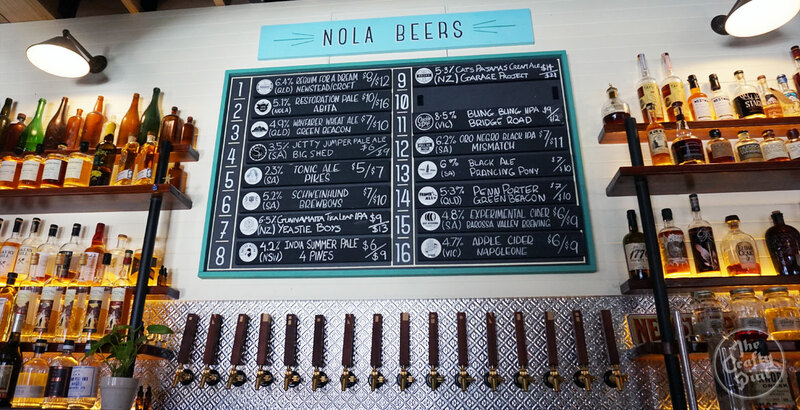 Since then, plenty of Australian breweries and bars (including the likes of Black Hops Brewing, Valhalla Brewing and NOLA Adelaide) have been able to launch or add features to their businesses (a bottling line at Black Hops, the tap system at NOLA pictured at the top of this article) thanks to the support of crowd. Yet local success pales in comparison to what has been achieved by breweries internationally. The UK’s largest craft brewery, BrewDog, first turned to crowdfunding in 2009, with their most recent Equity for Punks IV raising £19 million (a lot of money, but a long way short of their £25 million goal). Their most recent Equity for Punks USA was designed to raise enough money to open their first brewery in America. Closer to home, in August this year, Wellington’s ParrotDog (pictured above) broke PledgeMe’s crowdfunding record when they raised more than $1.2m (NZ dollars) in just 12 hours. In the weeks that followed they reached their goal of $2 million thanks to more than 800 individual investors who now own 16.8 percent of the brewery. But success doesn’t come without its critics. Back in 2014, when California’s Stone Brewing offered customers the chance to buy a series of one-off collaboration beers to help fund their new Berlin brewery they faced a barrage of outrage online. What business did one of America’s largest craft breweries have asking fans to fund their international expansion? Stone Brewing’s co-founder Greg Koch posted a video explaining that the brewery was merely seeking to use Indiegogo (one of the world’s largest crowdfunding platforms) as a presale event to give people a chance to buy some great collaboration brews. He also added that the use of Indiegogo came from a desire to be transparent with how people’s money was spent. Close to 14,000 people were willing to support the campaign, making it a resounding success and leading to Stone Berlin opening its doors in September this year. What Stone’s use of crowdfunding does show, however,is that breweries need to be careful when crafting their message and that established breweries can lose plenty of good will by using it. 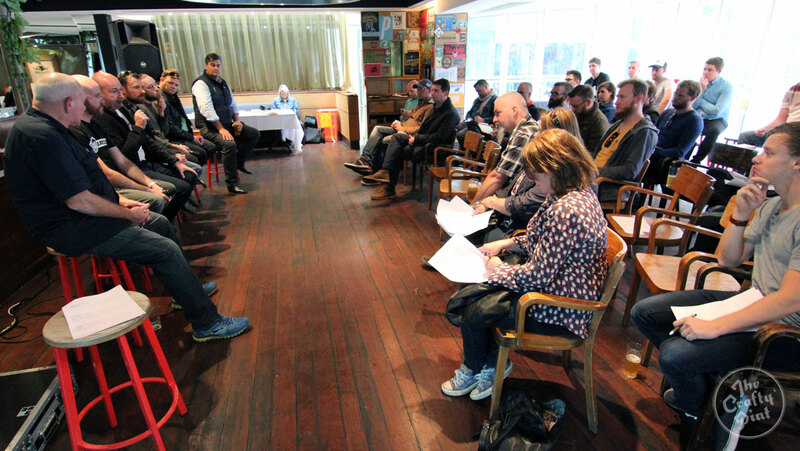 Dan Norris of Black Hops (fourth from left) and Elliot Chapple of Pozible (to his right) at a Cryermalt Brewery Startup Panel hosted by The Crafty Pint during Good Beer Week 2016. Overwhelmingly, it is rewards-based crowdfunding that is most commonly favoured in the Australian craft beer scene. Depending on how much someone is willing to spend, rewards may range from shout outs on social media to a few slabs of the brewery’s first beer. Anyone who has supported an Australian campaign (whether beer focused or otherwise) has a good chance of having gone through Pozible. Started by two mates who saw the benefits of a service that would help cash-strapped ideas get off the ground, the Melbourne-based company is Australia’s leading crowdfunding service. Elliot Chapple is the head of marketing at Pozible, which sees him work closely with new projects that seek to use the service. Elliot believes that part of the reason crowdfunding has become so popular is due to broader changes in the way people want to consume. These trends that prioritise independence and small-scale production fit well with many craft breweries. 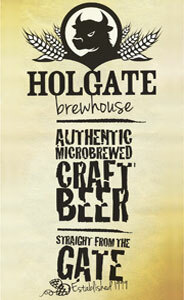 “I think there is definitely a craft movement,” says Elliot. “Nowadays people want a story behind the product and they want to buy something off someone who is passionate, not just someone trying to make money. There’s this ideology that a product is going to be better because someone’s poured their heart into it. Much like beer, as the crowdfunding industry matures, those hoping to be successful with crowdfunding need to work smarter if they want to reach their goals. Since it is increasingly hard for ideas to get noticed, effective marketing is now essential and good rewards that make people feel connected to a brand are a must. “You’re not going to get shared in the press anymore just because you’re running a crowdfunding campaign,” Elliot says. “Those days are over. Locally, one of craft beer's biggest success stories is Queensland’s Black Hops Brewing, who successfully used Pozible to raise enough money to complete their brewery. 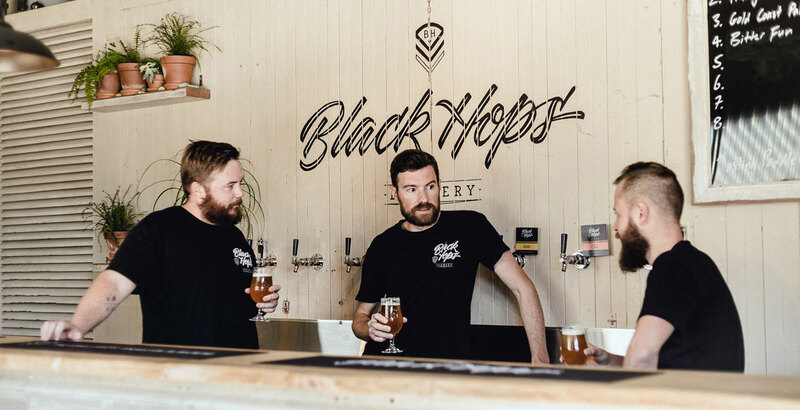 Dan Norris is one of the three mates behind Black Hops and his background in marketing left them well placed to take this route and maximise its potential. Like Elliot, Dan is also a firm believer that good marketing is a cornerstone of any effective craft beer crowdfunding campaign. Dan Norris (centre) with fellow Black Hops owners Michael McGovern and Eddie Oldfield. Beyond marketing, Dan also stresses that one of the keys to successfully delivering a project is transparency. Black Hops faced some minor delays in being able to deliver their rewards, but their communication managed to keep funders on their side. “It was probably harder and more expensive than we anticipated sending the rewards out,” says Dan. “We were a little bit late initially because the opening of our brewery was delayed but as long as you aren't too badly delayed and you are honest, it can all be managed. Elliot also emphasises this point. “It’s all about keeping the channels of communication open,” he says. “People know that new things are hard and that there are always going to be challenges and that things might change along the way. Equity crowdfunding occurs when a broad group of investors give money to a business to own a small part of it. Currently, equity crowdfunding is highly restricted in Australia, with small-scale investors being unable to buy into private companies. The Federal Government is currently in the process of re-introducing legislation to reform how crowdfunding is regulated in Australia. While these changes will allow more businesses to undertake equity crowdfunding than the current environment, at the time of writing they are yet to pass parliament. If the government is successful and the legislation gets through, those changes would take six months to be enacted. Furthermore, according to both the Federal Opposition and some industry leaders, Australia would still remain a more restrictive country to conduct crowdfunding than the likes of the UK. Change may be coming, but it is neither imminent nor exhaustive. Regardless, when it arrives we can expect breweries to turn to equity crowdfunding to grow. While some may find success, some breweries are just as likely to fail, taking a lot of people’s money with them. The question of who will find success with equity crowdfunding in Australia also arises. Will we soon have a BrewDog to call our own? When the topic “equity crowdfunding beer” is discussed, BrewDog almost always comes up, often seen as a template that can be replicated in other countries. The first thing to note is that while BrewDog may use the language of investing, in many ways Equity for Punks more closely resembles a reward-based crowdfunding method. 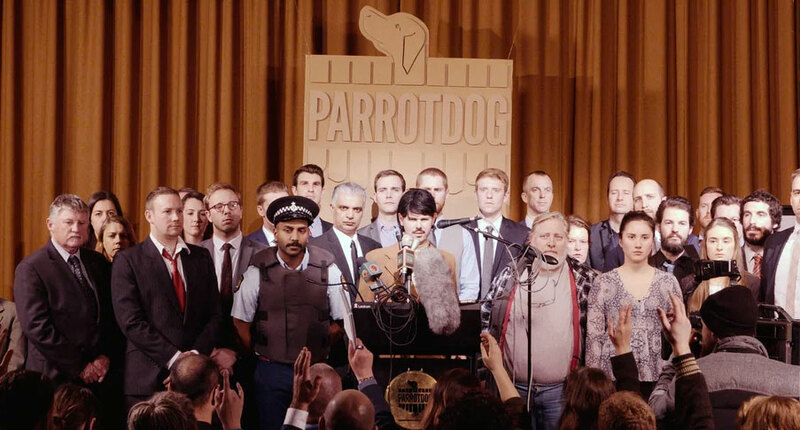 Shareholders haven't received dividends for their investment due to the company's policy of reinvesting all profits and, while they are invited to attend annual BrewDog AGMs, from all accounts they look and feel more like a beer festival than a meeting of shareholders. 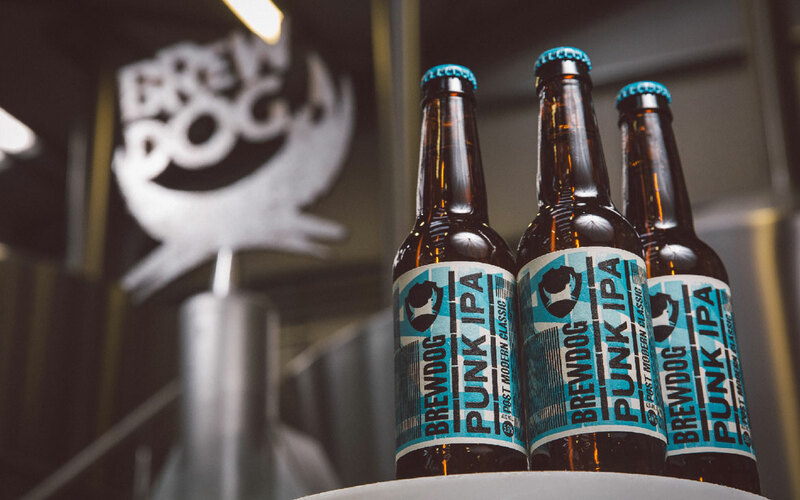 What investors do receive is a range of discounts from BrewDog’s bars and online stores, while also gaining first access to buy new and limited release beers. This means that “punks” that support BrewDog can get return on their investment through those discounts, but it also makes it seem more like buying into a beer club than investing in a company. This is hardly surprising; many successful crowdfunding campaigns employ a mixture of rewards-based and equity crowdfunding. Craft beer fans are, after all, a devoted bunch, often more interested in a brewery’s new beers than making money out of them. What the example of BrewDog does show is what it might take for Australian breweries to find success in equity crowdfunding. Notorious for their ability to generate free press, BrewDog are master marketers so there is probably no fair Australian brewery comparison. Nonetheless, those breweries that have built a committed fan base through their beers, social media and marketing are those most likely to find success early on and reap the benefits. Successful equity crowdfunding can further build on marketing success by building a community of brand ambassadors that will push a brewery out to anyone and everyone. The flow on effects of equity crowdfunding go far beyond just the amount of money raised. Even though BrewDog’s Equity for Punks IV failed to raise the requested £25 million, they still managed to generate plenty of free advertising and remind people just how bold they are. Dan says he understands the possible benefits of this route, and thinks that changes in equity regulations will further increase the number of breweries that go down this route. In other words, if you think crowdfunding is rife in Australia today, you ain’t seen nothing yet! Join us for part two as we further explore the ins and outs of crowdfunding in the beer world, both here and abroad. The Big Issue: Copyright Or Wrong?